Names in order you would like them to appear on pillow. 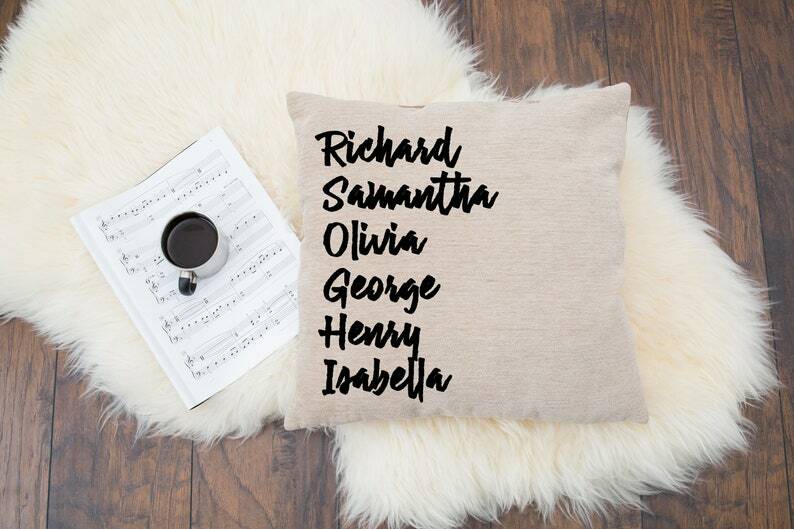 Personalize this pillow cover with your family member's names. Makes a great gift for mothers and grandmothers. Please include the names in the order you would like them listed on the pillow. Up to 20 names. Names may be printed in two columns if more than 12 names listed. Pillow cover measures 18 inches by 18 inches. 100% polyester, durable, heavy weight cream or grey colored fabric. Perfect colors for all styles of decor. Invisible zipper on the bottom of pillow cover. Design is professionally and permanently pressed onto cover and will not fade with washing.